The humour and gravity. I thought the movie struck a good balance between the two. There were funny moments, and there were serious ones. A lot of the humour came from Peter’s best friend, Ned (Jacob Batalon), who managed to demonstrate starry-eyed fanboy fascination and also a prudence that Peter would’ve done well to imitate at times. Peter’s attempts to figure out his suit’s “unlocked” features was pretty funny, and served to underscore Peter’s foolishness in attempting to learn them while trying to take on the bad guys. I appreciated that they gave some consequences to Peter’s misguided attempts to take on the Vulture by himself. 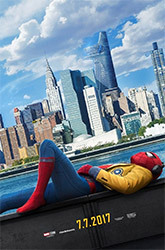 When a ferry full of people nearly sinks because of him, he’s forced to return his precious Stark-made Spider-Man suit and reconsider his actions. The scenes where Tony Stark lectures him severely, where Aunty May confronts him and he breaks down because he’s “lost the Stark internship”- those were very effective and poignant. Tony Stark. Tony Stark’s appearances in the movie contributed to both humour and gravity, and most of my favourite scenes in the movie involve Tony (the engagement at the end is the best). But the scene where he gives Peter a good talking-to was particularly well executed. Peter, assuming that Stark merely sent his robotic replacement to the rescue, accuses him of not caring. And then whoosh, Tony steps out of his suit to continue the scolding. It’s not even a surprise that it was really Tony Stark – I expected it to be so, but it was still pretty cool to watch. The timing, the editing, and the smooth VFX work… I could watch the scene again and again just to admire it. They gave Tony just enough scenes and lines for you to get the idea that he’s trying to be a sort of mentor to Peter Parker. He’s not doing it too well, but he’s trying. That this was not another origin story. Like Batman, we’ve seen enough of Spider-Man’s backstory that we don’t really need to see it all over again. I’m glad Marvel opted to skip that and instead tell a different story. Peter Parker’s attitude in 95% of the movie. This is probably a sign of age. I’m twice as old as Peter Parker (and the actor who plays him is 11 years younger than me). I found him so irritating throughout most of the movie. Nothing wrong with an earnest attitude but he just went too far for me. But I do think that Happy Hogan, whom Stark appointed as Peter’s sort-of supervisor, didn’t do a good job either. He seemed to be just ignoring Peter’s phone calls and messages and perhaps if he hadn’t then Peter wouldn’t have felt as frustrated. On some level, I understand why Peter behaved the way he did, but at the same time it still grates on me. Michelle. I get it. Evidently she’s supposed to be the new MJ and we’re supposed to be all interested in her because Peter will probably be interested in her in upcoming movies even though in this one he only has eyes for another girl. But I didn’t care about her at all. She came across as rather unlikeable and strange. She doesn’t seem to want to socialise at all, claims she has no friends, and doesn’t do much in the whole movie but at the end when she’s appointed the new academic decathlon captain, everyone was so happy about it that it puzzled me. Nowhere was I given to understand whether she was liked or disliked. At most it felt like the other students were rather apathetic towards her. Yet they were thrilled that she’s the new captain? It’s a new approach to the usual MJ characters, but I can’t say I really like it. I’m already not very invested in Peter Parker as a character, and if his love interest is even less appealing to me, that is just not helping. There were no weighty consequences to Peter’s behaviour in school. Yes, there were consequences to his foolish chase after the Vulture – Stark rescinded his “internship” offer and took back the fancy suit. Yes, he got detention and got called to the principal’s office. But… That was it?? He quit the academic decathlon team, then rejoined on the day they departed for the competition because he had ulterior motives, then went missing during the actual competition. I expect Ned to behave as usual, but the fact that everyone else just happily accepted him even after such betrayal (and it would have looked like betrayal to them since they don’t know he’s Spider-Man) is much harder for me to swallow. Just because he manages to take down the Vulture in the end, Tony Stark says hey, I misread you, it’s all good – and offers him an official spot in the Avengers. What? I thought it would’ve been more fitting if he’d made it a condition that Peter return to school and keep his performance in school up instead of telling him he can quit school and be a superhero. I was relieved that Peter rejected the offer… But we find out that Peter assumed it was merely a test of his character, not a real offer. If he had know that it was a real offer, would he have turned it down? It feels to me like Peter would have taken it if he knew it was real. That stupid party. What is it with high school and university student parties in American movies? They inevitably take place at some amazingly posh house, have blaring music (and sometimes flashing lights) that make it seem more like a night club, have practically open invitations to all the students, and some form of bullying or taunting happens at it. I need to go ask my American friends if these on-screen parties have any basis in reality. I didn’t notice the music much except at the very beginning when the Marvel logo appears and the theme is obviously a version of the Spider-Man song. At some point I thought, “I’m guessing Michael Giacchino did the music.” And he did. But I’m not sure if this is because I recognised a style, or because I read it earlier and forgot it but the subconscious memory was there. The Captain America videos were amusing. Did Mr. Delmar never question why or how Spider-Man knows his name? I’m not sure whether I like the implication that by the end of the next Spider-Man movie, Aunty May and MJ as well as Ned will know Peter’s secret identity. I guess it’s easier that way, but something about it bugs me a little. What excuse did Ned give the others when Peter failed to turn up for the decathlon?? I wonder if they did any digital work on Tony’s face. I thought his face looked like it was smoother than it should be in a couple of scenes.